Once you’re logged in, click on the user icon in the top-right navigation menu and then click on the “My Notifications” link. On the Notifications page, look for the On/Off toggle for “send attendance reminder text message” and toggle that on. You can also select from the drop-down when you’d like to receive the text. If the toggles are disabled or you don't see them, please check that you have your cell phone # set in your profile. You can do that by click on the user icon in the top right > My Profile and click on the Edit tab and set your cell # phone. 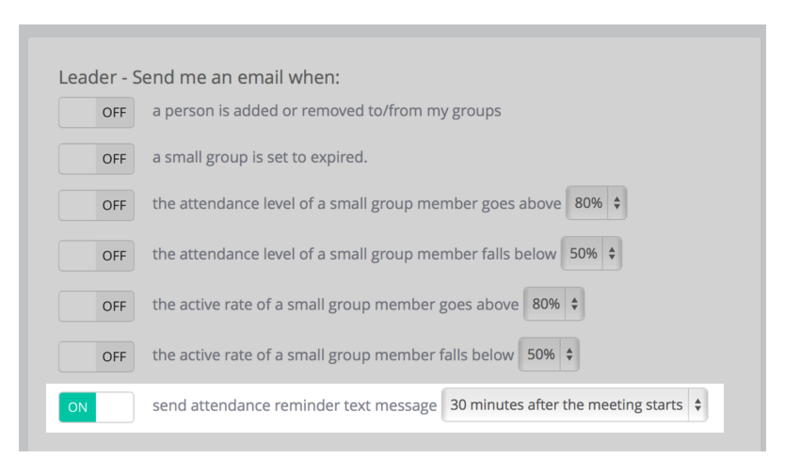 You'll now receive your first attendance text message the next time your group meets. To turn this off, come back to this same page and toggle this to "Off." See all the FAQ's for text attendance.